The Western Athletic Conference (WAC) is an American collegiate athletic conference formed on July 27, 1962 and affiliated with the National Collegiate Athletic Association (NCAA) Division I. 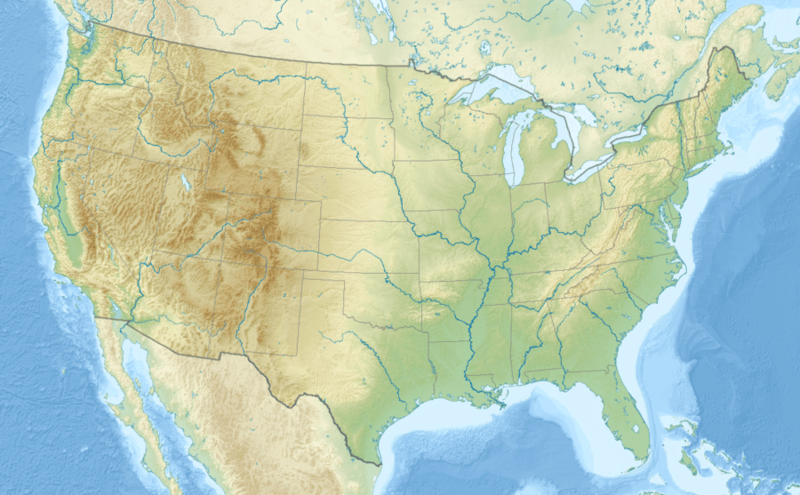 The WAC covers a broad expanse of the western United States, with member institutions located in Arizona, California, New Mexico, Utah, and Washington, along with the "non-western" states of Missouri, Illinois (traditionally associated with the Midwest), and Texas (traditionally associated with the South). Due to most of the conference's football-playing members leaving the WAC for other affiliations, the conference discontinued football as a sponsored sport after the 2012–13 season and left the NCAA's Football Bowl Subdivision (formerly known as Division I-A). The WAC thus became the first Division I conference to drop football since the Big West in 2000. The WAC then added men's soccer and became one of the NCAA's eleven Division I non-football conferences. The following institutions are the full members of the WAC for the 2015–16 academic year. With the elimination of football as a WAC-sponsored sport, New Mexico State's football program has joined the Sun Belt as an associate member. In July 2015, UTPA merged with the University of Texas at Brownsville to create the new University of Texas Rio Grande Valley (UTRGV). The University of Texas System stated in July 2014 that "the UTPA athletics program will be converted into the athletics program at UTRGV". On November 5, 2014, UTRGV's new nickname of Vaqueros was announced. The founding date for UTRGV listed in this table reflects that of Edinburg College, the institution that eventually became UTPA. According to U.S. News & World Report, RNP means a ranking was calculated, but is not published. Unranked means not enough information was provided to make a calculation. Championships title totals are through Spring 2016. The following 11 schools field programs in the WAC for sports not sponsored by their primary conferences. Four schools became affiliate members in men's soccer in July 2013; the WAC announced on January 9, 2013 that it would reinstate the sport, which it had sponsored from 1996 to 1999. Because the conference dropped football, it was necessary to add a new men's team sport to maintain its Division I status. It chose men's soccer because three of the confirmed members for 2013–14 (CSU Bakersfield, Grand Canyon, and Seattle) already sponsored the sport, and filled out its soccer ranks by attracting four schools from the Mountain Pacific Sports Federation. Three of these schools have past WAC connections—former full members Air Force, UNLV and San Jose State. After the WAC announced it would add men's soccer, the conference gained an eighth soccer school for the 2013 season when UMKC, which already sponsored the sport, joined. In addition, Utah Valley added the sport for 2014, UT-Pan American (now known as UT Rio Grande Valley) added it for 2015, and Chicago State is slated to add it for 2016. Four schools (three of which are former WAC full members: Air Force, UNLV and Wyoming; and North Dakota) became affiliate members in men's swimming and diving in July 2013; the WAC announced on May 16, 2013 that it would reinstate the sport, which it had sponsored from 1962 to 2000. Northern Colorado joined the WAC for baseball for the 2014 season (2013–14 academic year). North Dakota also joined the WAC for baseball in the 2014 season, but dropped the sport after the 2016 season. Sacramento State was formerly an associate member of the WAC in baseball from 1992–93 to 1995–96. Championships title totals are through Fall 2014. 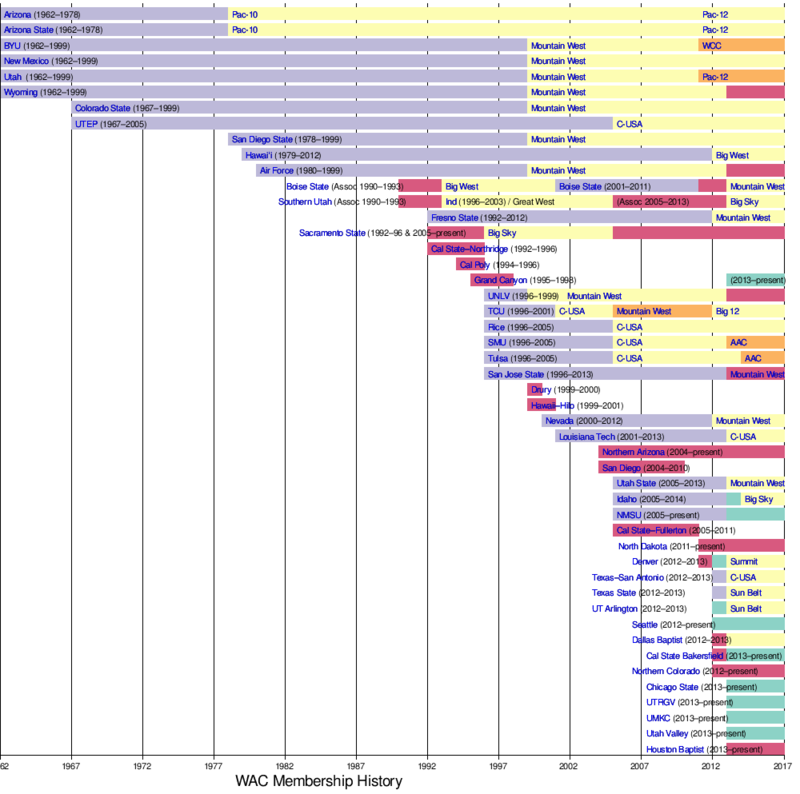 The WAC has 27 former full members. 1 2 Neither the Big Sky Conference nor the MW sponsors women's gymnastics. Boise State and Southern Utah house that sport in the Mountain Rim Gymnastics Conference. ↑ Cal State Fullerton no longer sponsors women's gymnastics. ↑ The Big Sky Conference does not sponsor women's gymnastics. Sacramento State houses that sport in the Mountain Pacific Sports Federation. ↑ The Dallas Baptist baseball team currently competes as a single-sport member of the Missouri Valley Conference. ↑ The Summit League does not sponsor women's gymnastics. Denver houses that sport in the Big 12 Conference. ↑ The WCC does not sponsor women's swimming and diving. San Diego houses that sport in the Mountain Pacific Sports Federation. Prior to the 1996–97 season, both Air Force and Hawaii had most to all of their women's sports competing in other conferences before joining the WAC full-time with their men's sports counterparts. At that time, Air Force was in the Colorado Athletic Conference, and Hawaii was in the Big West Conference. The WAC formed out of a series of talks between Brigham Young University athletic director Eddie Kimball and other university administrators from 1958 to 1961 to form a new athletic conference that would better fit the needs and situations of certain universities which were at the time members of the Border, Skyline, and Pacific Coast Conferences. Potential member universities who were represented at the meetings included BYU, Washington State, Oregon, Oregon State, Utah, New Mexico, Arizona, Arizona State, and Wyoming. While the three Washington and Oregon schools elected to stay in a revamped Pac-8 Conference that replaced the scandal-plagued PCC, the remaining six schools formed the WAC. The Border and Skyline conferences, having each lost three of their stronger members, dissolved at the end of the 1961–62 season. The charter members of the WAC were Arizona, Arizona State, BYU, New Mexico, Utah, and Wyoming. New Mexico State and Utah State applied for charter membership and were turned down; they would eventually become WAC members 43 years later. The conference proved to be an almost perfect fit for the six schools from both a competitive and financial standpoint. Arizona and Arizona State, in particular, experienced success in baseball with Arizona garnering the 1963 College World Series (CWS) runner-up trophy and ASU winning the CWS in 1965, 1967, and 1969. Colorado State and Texas-El Paso (UTEP), at that time just renamed from Texas Western College, joined in 1967 to bring membership up to eight. With massive growth in the state of Arizona, the balance of WAC play in the 1970s became increasingly skewed in favor of the Arizona schools, who won or tied for all but two WAC football titles from 1969 onward. In the summer of 1978, the two schools left the WAC for the Pac-8, which became the Pac-10, and were replaced in the WAC by San Diego State and, one year later, Hawaii. The WAC further expanded by adding Air Force in the summer of 1980. A college football national championship won by Brigham Young in 1984 added to the WAC's reputation as one of the best NCAA Division I conferences. This nine-team line-up of the WAC defined the conference for nearly 15 years. Fresno State expanded its athletic program in the early 1990s and was granted membership in 1992 as the nationwide trend against major college programs independent of conferences accelerated. The WAC merged with the High Country Athletic Conference, a parallel organization to the WAC for women's athletics, in 1990 to unify both men's and women's athletics under one administrative structure. In 1996, the WAC expanded again, adding six schools to its ranks for a total of sixteen. Rice, TCU, and SMU joined the league from the Southwest Conference, which had disbanded. Big West Conference members San Jose State and UNLV were also admitted, as well as Tulsa from the Missouri Valley Conference. Also, two WAC members for men's sports at the time, Air Force and Hawaiʻi, brought their women's sports into the WAC. With the expansion, the WAC was divided into two divisions, the Mountain and the Pacific. Quadrant one was always part of the Pacific Division, and quadrant four was always part of the Mountain Division. Quadrant two was part of the Pacific Division for 1996 and 1997 before switching to the Mountain Division in 1998, while the reverse was true for quadrant three. The scheduled fourth year of the alignment was abandoned after eight schools left to form the Mountain West Conference. The division champions in football met from 1996 to 1998 in a championship game at Sam Boyd Stadium (also known as the Silver Bowl) in Henderson, Nevada. A USA Today article summed up the reasons behind the split. "With Hawaii and the Texas schools separated by about 3,900 miles and four time zones, travel costs were a tremendous burden for WAC teams. The costs, coupled with lagging revenue and a proposed realignment that would have separated rivals such as Colorado State and Air Force, created unrest among the eight defecting schools." In 2000, the University of Nevada, Reno (Nevada) of the Big West joined as part of its plan to upgrade its athletic program. TCU left for Conference USA in 2001 (it would later leave C-USA to become the ninth member of the Mountain West in 2005, and joined the Big 12 in 2012). The Big West announced that it would drop football after the 2000 season, but four of its football-playing members (Boise State, Idaho, New Mexico State, and Utah State) were unwilling to drop football. Boise State was invited to join the WAC and promptly departed the Big West, while New Mexico State and Idaho joined the Sun Belt Conference (NMSU as a full member, Idaho as a "football only" member) and Utah State operated as an independent D-IA program. At the same time, Louisiana Tech (LA Tech) ended its independent D-IA status and also accepted an invitation to join the WAC with Boise State. In 2005, Conference USA sought new members to replenish its ranks after losing members to the Big East, which had lost members to the ACC. Four WAC schools, former SWC schools Rice and SMU, as well as Tulsa and UTEP, joined Conference USA. In response, the WAC added Idaho, New Mexico State, and Utah State – all former Big West schools which left the conference in 2000 along with Boise State when that conference dropped football. The three new schools were all land grant universities, bringing the conference total to five (Nevada and Hawaiʻi). The decade of the 2010s began with a series of conference realignment moves that would have trickle-down effects throughout Division I football, and profoundly change the membership of the WAC. Boise State decided to move to the Mountain West Conference (MWC) for the 2011–12 season, and to replace departing BYU, the MWC also recruited WAC members Fresno State and Nevada for 2012–13. WAC commissioner Karl Benson courted several schools to replace those leaving, including the University of Montana, which declined, as well as the University of Denver, University of Texas at San Antonio, and Texas State University-San Marcos, which all accepted effective 2012–13. But the resulting eastward shift of the conference's geographic center led Hawaiʻi to reduce travel expenses by becoming a football-only member of the MWC and joining the California-based Big West Conference for all other sports. Further invitations were then issued by the WAC to Seattle University and the University of Texas at Arlington. These changes meant that the conference would have 10 members for 2012–13, seven of which sponsored football, and Benson announced that the WAC planned to add two additional football-playing members to begin competition in 2013. A further boost came when Boise State decided to join the Big East in football, and return to the WAC in most other sports, as of the 2013–14 academic year. So by the end of 2011, the WAC seemed to have weathered the latest round of conference changes, and once again reinvented itself for the future. But from this seemingly strong position, early 2012 brought forth a series of moves that shook the conference to its very core, beginning with Utah State and San Jose State accepting offers to join the MWC. Four similar announcements followed with Texas-San Antonio and Louisiana Tech jumping to Conference USA, plus Texas State and UT Arlington heading to the Sun Belt Conference, all as of 2013–14. Boise State also canceled plans to rejoin the WAC, instead opting to place its non-football sports in the Big West Conference, before eventually deciding to simply remain in the MWC. These changes left the WAC's viability as a Division I football conference in grave doubt. The two remaining football-playing members, New Mexico State and Idaho, began making plans to compete in future seasons as FBS Independents; they ultimately spent only the 2013 season as independents, rejoining their one-time football home of the Sun Belt as football-only members in 2014. In order to rebuild, as well as forestall further defections, the conference was forced to add two schools—Utah Valley University and CSU Bakersfield—which were invited in October 2012 to join the WAC in 2013–14, but this did not prevent two more members from leaving. Denver decided to take most of its athletic teams to The Summit League as of the 2013–14 season, shortly after Idaho opted to return all of its non-football sports to the Big Sky Conference in 2014–15. The conference responded over the next two months by adding Grand Canyon University, Chicago State University, and the University of Texas-Pan American. Then, in February 2013, the WAC announced the University of Missouri–Kansas City would join in the summer of 2013 as well. These changes would put the conference's membership at eight members by 2014 with only one, New Mexico State, having been in the WAC just three years earlier. Due to losing the majority of its football-playing members, the WAC would stop sponsoring the sport after the 2012–13 season, thereby becoming a non-football conference. While the WAC has had no changes in membership since the departure of Idaho, one member school has changed its identity. In 2013, the University of Texas System announced that Texas–Pan American would merge with the University of Texas at Brownsville; the new institution, the University of Texas Rio Grande Valley (UTRGV), began operation for the 2015–16 school year. UTRGV inherited UTPA's athletic program and WAC membership. The Western Athletic Conference currently sponsors championship competition in nine men's and ten women's NCAA sanctioned sports. Nine schools are currently Associate members in four sports. Men's soccer was a newly sponsored sport for 2013–14; UTRGV will add it for 2015, and Chicago State is also to add it. In softball, the WAC has six softball members; however, because softball-sponsoring Grand Canyon is reclassifying from Division II to Division I, it is not eligible for the conference tournament. * = Affiliates Northern Colorado and Sacramento State. # = Affiliates Air Force, Houston Baptist, Incarnate Word, San Jose State, and UNLV. † = Affiliates Air Force, North Dakota, UNLV, and Wyoming. Grand Canyon — Volleyball (M) will join the Mountain Pacific Sports Federation in 2017. * = Affiliates North Dakota, Northern Arizona, and Northern Colorado. The WAC sponsored football from its founding in 1962 through the 2012 season. However, the defection of all but two football-playing schools to other conferences caused the conference to drop sponsorship after fifty-one years. The WAC has claimed seven NCAA baseball national championships. The most recent WAC national champion is the 2008 Fresno State Bulldogs baseball team. For other sports, only a postseason champion is recognized. Note: KeyArena is configured for 8,901 capacity for Seattle games. Seattle U also plays multiple home games at the Connolly Center (capacity 999) during the season as well. The WAC awards its Commissioner's Cup to the school that performs the best in each of the conference's 19 men's and women's championships. Named in honor of former WAC commissioner Dr. Joseph Kearney, the awards are given annually to the top male and female WAC athlete. The various WAC member institutions Athletics Directors select the male award winner, while the WAC member instituitions Senior Women's Administrators choose the female honoree. The award is named in honor of former WAC Commissioner Stan Bates and honors the WAC's top male and female scholar-athletes, recognizing the recipients’ athletic and academic accomplishments. In addition, the awards carry a $3,000 postgraduate scholarship. 1 2 Moss, Irv (August 20, 2012). "WAC to drop football after 2012 season, commissioner Hurd says". The Denver Post. Retrieved 16 December 2012. ↑ "Project South Texas: Timeline". University of Texas System. Retrieved August 4, 2014. ↑ "Project South Texas: Ask a Question". University of Texas System. July 30, 2014. Retrieved August 4, 2014. ↑ Brito, Victoria (November 5, 2014). "UT-RGV mascot recommended to be the Vaquero". The Monitor. McAllen, Texas. Retrieved November 5, 2014. ↑ "How U.S. News Calculated the 2015 Best Colleges Rankings". US News & World Report. September 8, 2014. p. 2. Retrieved November 17, 2014. 1 2 WAC Team Champions. Wac.org. ↑ "WAC Adds Men's Soccer" (Press release). Western Athletic Conference. January 9, 2013. Retrieved April 20, 2013. ↑ WAC Reinstates Men's Swimming & Diving – WACSports.com—Official Web Site of the Western Athletic Conference. Wacsports.com (2013-05-16). Retrieved on 2013-08-23. ↑ – February 11, 2013. http://www.wacsports.com (February 11, 2013). 1 2 Deinhart, Tom (September 14, 2011). "WAC a cautionary tale for superconferences". Rivals.com. Yahoo! Sports. Retrieved September 14, 2011. ↑ Deinhart, Tom (September 14, 2011). "WAC a cautionary tale for superconferences". Rivals.com. Yahoo! Sports. Retrieved July 12, 2013. ↑ WAC disbanding? – rec.sport.softball | Google Groups. Groups.google.com. ↑ "Boise State moves to Mountain West". ESPN. June 11, 2010. Retrieved June 11, 2010. ↑ "Fresno State, Nevada to remain in WAC until 2012". ESPN. 2010-10-28. Retrieved 2013-08-09. ↑ Adelson, Andrea. "Utah State turned down invite to MWC". ESPN. Retrieved 2013-08-09. ↑ Buerkle, Derek (September 29, 2010). "WAC Commissioner recognizes UM would be "perfect fit"". KPAX Sports. Retrieved July 5, 2012. ↑ "UM staying in Big Sky Conference". KPAX Sports. November 11, 2010. Retrieved July 5, 2012. ↑ Sources: Denver University, Texas-San Antonio and Texas State to join WAC – ESPN. Sports.espn.go.com (2010-11-10). Retrieved on 2013-08-23. ↑ Ernst, Cheryl (November 19, 2010). "UH joins Mountain West, Big West conferences". Mālamalama, The Magazine of the University of Hawaiʻi. Retrieved July 5, 2012. ↑ Katz, Andy (December 10, 2010). "Hawaii joins MWC, Big West for 2012". ESPN. Retrieved July 5, 2012. ↑ WAC Announces Addition of Seattle – WACSports.com—Official Web Site of the Western Athletic Conference. Wacsports.com (June 14, 2011). ↑ The Mavericks Join the WAC. MyArlingtonTX.com. Retrieved on 2013-08-23. ↑ The Salt Lake Tribune. Sltrib.com. ↑ "WAC Standing Strong Amid Changing Landscape". WAC. Retrieved October 27, 2011. ↑ "Boise State Announces New Conference Affiliations". Bronco Sports. Boise State Sports Information. December 7, 2011. ↑ Jones, Tony (April 29, 2012). "Utah State is headed for Mountain West Conference". Salt Lake Tribune. Salt Lake Tribune. Retrieved April 30, 2012. ↑ McMurphy, Brett (May 2, 2012). "Conference USA reloading by adding 6 schools". CBSSports. CBSSports. Retrieved May 2, 2012. ↑ "Texas State headed to Sun Belt Conference in July 2013 after only 1 WAC season". Washington Post. Associated Press. May 2, 2012. Retrieved May 2, 2012. ↑ "Texas State to Join Sun Belt Conference" (Press release). Sun Belt Conference. May 2, 2012. Retrieved May 5, 2012. ↑ "Conference USA Adds Five New Members" (Press release). Conference USA. May 4, 2012. Retrieved May 5, 2012. ↑ "San José State, Utah State to Join Mountain West" (Press release). Mountain West Conference. May 4, 2012. Retrieved May 5, 2012. ↑ "UT Arlington to join Sun Belt Conference in 2013–14". UT-Arlington Athletics. May 24, 2012. Retrieved July 5, 2012. ↑ "Boise State to Remain as Football Only Member in Big East Conference". Boise State Sports Information. June 30, 2012. Retrieved July 8, 2012. ↑ "Boise State To Join Big West Conference". Big West Conference. August 24, 2012. Retrieved August 24, 2012. ↑ Andrea Adelson (June 25, 2012). "Boise State risks missing deadline". ESPN. Retrieved July 8, 2012. ↑ Irv Moss (July 3, 2012). "Western Athletic Conference considers becoming a non-football league". Denver Post. Retrieved July 31, 2012. ↑ "Idaho and New Mexico State to Join Sun Belt Conference As Football members in 2014" (Press release). Sun Belt Conference. March 27, 2013. Retrieved March 28, 2013. ↑ WAC adds Utah Valley, Cal State Bakersfield – The Lewiston Tribune: Idaho Vandals. Lmtribune.com (2012-10-09). Retrieved on 2013-08-23. ↑ "Denver Becomes The Summit League's Newest Member" (Press release). The Summit League. November 27, 2012. Retrieved November 27, 2012. ↑ Kasper, John. "Idaho To Return in 2014". sidearmsports. Retrieved 20 October 2012. ↑ "Grand Canyon University to Join WAC" (Press release). Western Athletic Conference. November 27, 2012. Retrieved November 27, 2012. ↑ "Chicago State headed to WAC" (Press release). ESPN.com. December 5, 2012. Retrieved December 5, 2012. ↑ Brett McMurphy (November 29, 2012). "UTPA says WAC invited it to join" (Press release). ESPN College Sports. Retrieved December 1, 2012. ↑ "UTPA to go to board Dec. 18 for WAC invite". The Monitor. December 5, 2012. Retrieved December 8, 2012. ↑ UMKC Heading to the Western Athletic Conference – UMKC Athletics. Umkckangaroos.com. Retrieved on 2013-08-23. ↑ WACSports.com—Official Web Site of the Western Athletic Conference. Wacsports.com. Retrieved on 2013-08-23. ↑ "University Budget Committee minutes" (PDF). Chicago State University. April 26, 2016. Retrieved 2 September 2016. ↑ "Men's volleyball to join MPSF in 2018". Grand Canyon University. Retrieved June 30, 2016. ↑ Western Athletic Conference considers becoming a non-football league. The Denver Post. Retrieved on 2013-08-23. ↑ . Wacsports.com (2015-12-04). Retrieved on 2015-12-04. ↑ "CSUB 2014 Softball Media Guide" (PDF). gorunners.com. Retrieved 7 October 2014. ↑ "Chicago St. 2013–14 Division I Baseball". National Collegiate Athletic Association. Retrieved February 6, 2015. ↑ "About Us Grand Canyon University Arena". Grand Canyon University. Retrieved October 31, 2014. ↑ "WAC 2014 Softball Media Guide" (PDF). wacsports.com. Retrieved 7 October 2014. ↑ "Municipal Auditorium – UMKC Athletics". Umkckangaroos.com. Retrieved 2015-07-23. ↑ "Pan American Center". New Mexico State University Athletics. Retrieved October 19, 2016. The arena, which currently has a seating capacity of 12,482, has hosted the NCAA Men’s Basketball Midwest Regional, several NCAA first round games, state high school basketball tournaments and hundreds of concerts featuring some of the top entertainers in America including George Strait, Carrie Underwood, Luke Bryan, Garth Brooks, Willie Nelson, Pearl Jam and Notorious B.I.G. ↑ "Seattle 2013–14 Division I Baseball". National Collegiate Athletic Association. Retrieved February 6, 2015. ↑ Jonah Goldberg. "UTRGV Men's Soccer 2015 Informational Guide" (PDF). UTRGV Athletics Communications Office. p. 2. Retrieved September 1, 2015. ↑ "The Official Athletics Website of the University of Texas Rio Grande Valley – UTRGV Fieldhouse". Goutrgv.com. Retrieved 2015-07-23. ↑ "2014 Men's Soccer". San Jose State University. p. 1. Retrieved January 13, 2015.